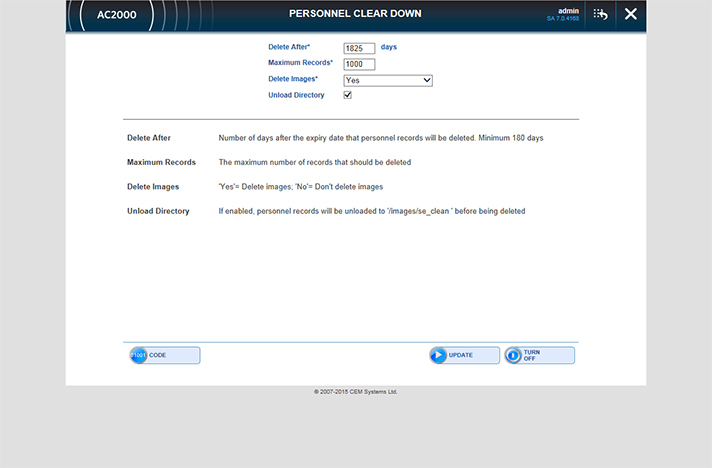 AC2000 Personnel Clear down is a data housekeeping utility that automatically deletes expired personnel records from the AC2000 database. The Personnel Clear Down tool is activated via a Licence key, which is provided by CEM Systems. System administrators gain access to the personnel clear down tool via AC2000 WEB. The user friendly web interface allows an administrator to specify when the personnel and card details are to be deleted i.e. how many days after a cardholder’s last expiry date need to elapse before automatic deletion. The administrator can also specify whether images are to be deleted.